We began a new journey of reading through the Bible as a family this week. In January, I began reading through the Bible chronologically as part of my personal devotion time. As I read, I saw how beneficial it would be to do this with the family. Karen DeBeus started this same journey with her family about 4 months ago. I would encourage you to visit her blogs Bible Based Homeschooling and Simply Living for Him. Prior to reading her blogs about her family's experience, I had completely overthought the entire process, ending in talking myself out of the idea completely. I am a planner. I am also an over-thinker. (Which is what got me started reading Karen's Simply Living for Him blogs years ago.) But I stopped all the planning... reading through the Bible as a family is NOT that complicated. I revisited Karen's blog again last week and decided this was the right time for our family to begin our own journey. In this first week I was blessed to see how excited my children were to "dig deep" into the Word of God as a family. They felt very comfortable to stop us and ask questions as we read. This first week we've made it all the way to Abram and Lot, getting ready to start discussing the happenings of Sodom and Gomorrah. Will we get into some delicate reading? Most definitely. I have discussed several of the readings I've had from my personal devotion time with them, so they are already aware there is a large portion of fighting and wars in the Old Testament. They also know some people had many wives. I explained that when Jesus came many things changed as far as that sort of thing goes. (They accepted that answer.. it built suspense and gave them something to look for once we get further down into God's Word.) We know we will face other questionable topics along our journey, but I am confident the Lord will give us wisdom in each circumstance as they arise. 1. Where should we start? Start at the beginning - Genesis. It's always a good idea to start from the beginning. The beginning builds the foundation and will help your children gain a clearer understanding of God's Word as you read on. 2. What version should you read from? This is where I really got stuck. Don't be like me. Don't get stuck here. I would recommend that most of the family members read from the same version so everyone is able to follow along easily; however, don't let this slow you down either. 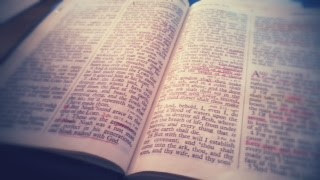 When we started, we all were using our King James Version Bibles, but as the questions went on, we pulled out a few various versions to compare. If you don't have other versions, Bible Gateway offers a free app for your devices which has several versions for comparison. 3. How much should we read each day? That is really going to depend on the family, the ages of your children, and where you are in the Bible at the specific time. The first night I had imagined we would fly through the first part of Genesis since we had studied it at such length last year, but I was wrong. It took us about 30 minutes to get through the first chapter. My kids were very excited and were ready to dig deep into meanings and share their thoughts. On average I would say we read about 15 minutes and discussed another 15+ minutes. Again, this will vary for each family and topic. 4. How long will it take to read through the entire Bible as a family? Don't rush it. I have no idea when we will finish. If you have older kids, I'm sure you can download one of those plans to read through the Bible chronologically in a year, but you also run the risk of "getting behind" and then never picking it up again. Plus, give yourself the freedom to study one section as long as it is needed. If we had not already done such an extensive study on the Garden of Eden and Noah's Ark, I'm sure we'd still be there. 5. How do you find the time? Well, I will just be honest with you. God blessed our family with the time. We came home one day and realized all our cable TV channels were gone. We loved curling up on the couch after my husband came home from work, and we'd watch Little House of the Prairie and The Walton's. But our contract was up and we no longer got those channels anymore. Paying out more for our cable was not an option, so we began focusing on a family devotion time. It's amazing how much more time you have once the TV isn't an issue. This is awesome, Ginger! May I share on my page to enocourage others?